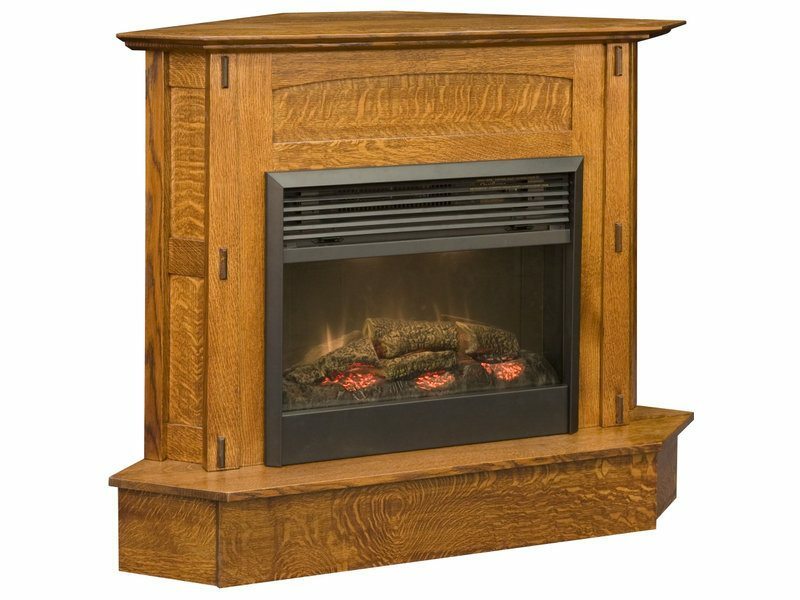 The Modesto Corner Fireplace is designed to make the favorite corner of your living room or den the warmest, most welcoming place for family and friends to gather. So check out its eye-catching reverse panels. Plus its mortise and tenon joints and solid hardwood construction. We equipped the fireplace with the Dimplex Flame Insert. And it features a patented 3D electric flame technology. So you’re able to enjoy a realistic flame effect. Plus generating up to 4,600 BTUs. And that’s enough to heat a 400 sq. ft. area. You’ll also get a full-function remote. Plus a 2-year limited in-home warranty through the manufacturer. Options include a DVD/TV component shelf above the fireplace. Plus, you can add a flip-down door. Looking for an alternative to the Modesto Corner Fireplace? 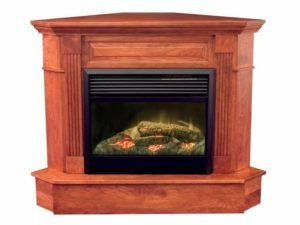 You can select the Modesto Fireplace — a wall unit. 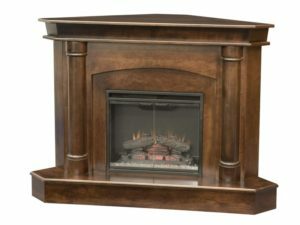 Also, you can order the Modesto Corner Fireplace as shown or unfinished. And we can customize it to your specs. Amish cabinetmakers meticulously handcraft each Modesto Corner Fireplace. And they use genuine hardwoods. Like maple, hickory, cherry and quarter-sawn white oak (shown with Michael’s Cherry finish). So we made the fireplace beautiful, sturdy and long-lasting. For a quote, click on the “Custom Options” link. Then, select the wood specie/finish and the other optional features listed. Also, complete the “Request Your Quote” field. Because this is the best place to tell us your other custom ideas. And if you’re relatively close to Shipshewana, Indiana, visit our store. And explore our wide assortment of quality, Amish-built, solid hardwood furniture for yourself.